Carbohydrates provide your body with quick energy and support bodily functions. The Institute of Medicine recommends a daily intake of about 130 grams of carbs daily for adults. A 5-ounce serving of red wine supplies you with about 4 or 5 grams of carbohydrates, depending on the type you're drinking. 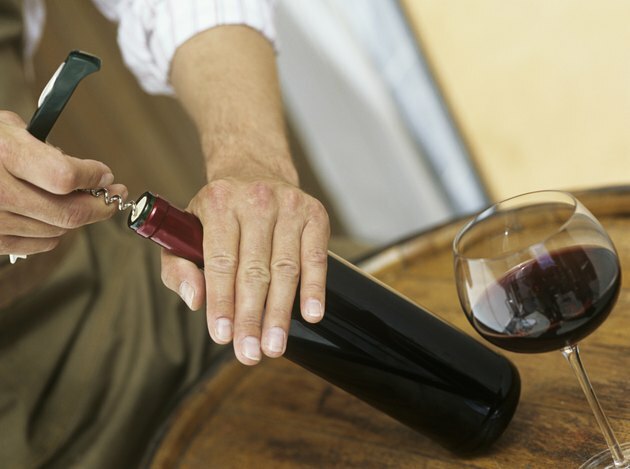 Red wine provides no vitamins, minerals or fat. When drinking 5 ounces of this robust and medium acidic red wine, you add 4.2 grams of carbohydrates to your diet. A serving of Zinfandel also has 129 calories. This wine offers a hint of berry and pepper flavors and pairs well with meals made with tomato sauce and barbecue sauce, as well as grilled meat. Cabernet franc, produced from grapes known as cabernet gris, bouchet, Breton, carmenet and grosse vidure, has a gentle, dry flavor and tastes best when served cool. A 5-ounce serving of cabernet franc has 3.6 grams of carbohydrates and 127 calories. The spicy, aromatic mix of vanilla, cherry and blackberry and smooth finish complement chicken, turkey, duck and pasta. This highly acidic red wine has 3.9 grams of carbohydrates and 126 calories in a 5-ounce serving. Sangiovese is a dry, light red wine with an earthy, full body. The berry and plum flavors create a strong wine that pairs well with Mediterranean cuisine, cheese, poultry, fish, pork and red meat. A 5-ounce serving of merlot's berry and plum bouquet gives you 3.7 grams of carbohydrates and 122 calories. It is a medium-bodied, soft wine with low acidity and a medium red tone fermented from crisp, dark blue, sweet grapes. Merlot's mellow softness accompanies all types of food. Fermented from grapes in France known as petit cabernet, vidure and petit bouchet, 5 ounces of cabernet sauvignon adds 3.8 grams of carbohydrates and 122 calories to your diet. This wine matures slowly until it reaches a deep purple color and rich flavor. The blend of multiberry fruit pairs with decadent dark chocolate, strong cheese and meat.